A. Help your church obey all of Jesus’ final commands. The four Gospels (Matthew, Mark, Luke and John), as well as the Book of Acts, record various aspects of Jesus’ Great Commission. a) Its Disciple-maker’s curriculum consists of all that Jesus commanded. “All authority has been given to Me in heaven and on earth. Go therefore and make disciples of all nations, baptizing them in the name of the Father and the Son and the Holy Spirit, teaching them to observe all that I commanded you; and lo, I am with you always, even to the end of the age” (Matthew 28:18-20). b) Its universal scope and warning covers all creation and condemnation of disbelief. “Go into the all world and proclaim the good news to all. He who believes and is baptized shall be saved; he who disbelieves shall be condemned” (Mark 16:15-16). c) Its historical facts make up the gospel to be proclaimed to all nations: Jesus’ death and resurrection bringing forgiveness to all who repent. “It is written that the Christ would suffer and rise again from the dead the third day, and that repentance for forgiveness of sins would be proclaimed in His name to all nations, starting in Jerusalem. You are witnesses of these things” (Luke 24:16-18). d) Its Delegated authority with power from the Holy Spirit to forgive sins. “Peace be with you; as the Father has sent Me, I also send you.” When He had said this, He breathed on them and said, “Receive the Holy Spirit. If you forgive the sins of any, their sins have been forgiven them; if you retain the sins of any, they have been retained” (John 20:21-23). e) Its instruction on where to go and how with power to witness for Jesus anywhere. “You will receive power when the Holy Spirit comes upon you; and be My witnesses in Jerusalem, Judea, Samaria, and the remotest part of the earth” (Acts 1:8). 1. Coastal cities. Before AD 1800, missionaries from Europe went with sailors, soldiers and merchants as chaplains to pastor their countrymen; churches arose on the coasts of many lands. 2. Continental interior. Missionaries penetrated deeply into the inhabited continents by the year 1900. Some agencies took on names that included “Inland,” such as China Inland Mission. 3. Specific ethnic groups. In the 1900’s, missionaries reached beyond dominant cultures to tribes and other people groups. Agencies like “New Tribes” arose. 4. The current frontiers lie where authorities outlaw missionary work. A third of the world’s people include Muslims, Buddhists, Hindus and Communists. C. Help your church deal with other cultures. Human culture stands as biggest challenge to global missions. Workers from outside find vastly diverse worldviews in other cultures. 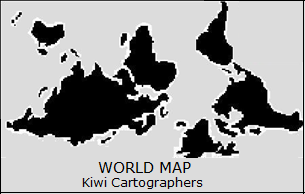 For example, some cultures in the southern hemisphere prefer maps to show the earth from their viewpoint that seems upside-down to Northerners. Not only their view of the world, but many other cultural norms appear just as “upside-down” to workers from the outside who sometime force local seekers and new believers to adopt their outsiders’ worldview in order to follow Jesus. Instead, workers should let Jesus enter the local culture and transform it from within, leaving morally right cultural norms and practices as they are. am looking agroup of your kind for discipleship hope we can connect thank you, jason am from Tanzania with joy church.